This is one of my favorite photos from this past snowy weekend. 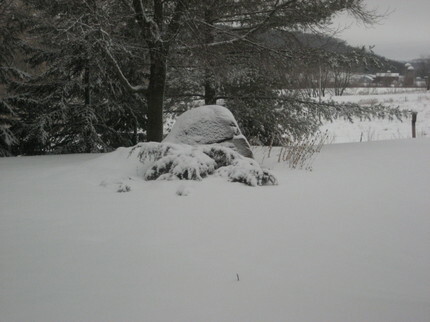 The big rock under the snow is a rather, er, prominent feature of our front yard and one I think is a nice one. During the spring, summer and fall, the cats jump/climb to the top and observe their domain. There is also a light colored toad that lives in a crack in the rock. (DH will remember what kind of toad.) In good weather he's easiest to spot when the sun is setting and he's looking for an evening meal. This spring and summer I will be working on redesigning the flower garden surrounding the rock. I haven't done much to tend it since we moved in and it needs to be refreshed totally re-done. I plan to add more hostas and move some of the other perennials. And if you are into Feng Shui, I imagine the rock as an excellent place for a dragon to rest his feet. At lunch I'm mailing the wrist warmers off to my dad. I've made some progress on Sonnet but not much that would show up in a new photo. I do have to say that I cannot do a box stitch and have a glass of wine at the same time if I don't want to frog. I just can't seem to stay in pattern after the first sip of merlot. duh. Well, first off, I didn't stop at the yarn store on my drive home despite the urging of my internal yarn hoarder. 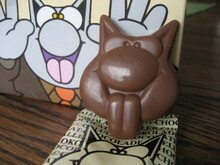 I did however, stop at a speciality grocery in Brookfield, V. Richards, and came home with some chocolate. 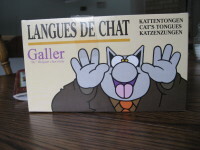 Yummy and funny....how could I resist??? I finished the wrist warmers for my dad though you see my hands modeling them for your viewing enjoyment courtesy of DH's photography. They are drying from a washing to see if they will get a bit softer, though they were certainly acceptable before the wash. I'll mail them to Dad on Monday if I can make it to the post office depending on road conditions. So, I'm settling in for a nice blizzard weekend. DH and I have two nice meals planned: grilled salmon with a salad tonight and a roast duck with stuffing tomorrow night. After I finish laundry, the weekend is pretty open chore-wise. 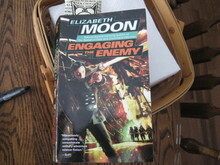 I plan to knit more on Sonnet and I started a science fiction paperback this morning. Knitting is relaxing (usually) but reading really takes me away and lets my brain completely disengage. Reading fiction (especially science fiction/fantasy and mystery) is one of my ways of disengaging from any stress. The wrist warmer fit Dad just fine and progress has been made on the second of the pair on the drive to and from the Farm. He liked the warmth of the wool and the size. I'm making the medium with 44 cast-on stitches. I'm happy to say I was able to remember TECHknitter's circular cast-on method in the car. I should have the second warmer finished this week and have both blocked by the weekend. We traveled up primarily to belatedly celebrate my mother's birthday (& DH's birthday as well). 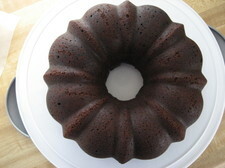 So, I made a bundt cake using a mix from William-Sonoma. 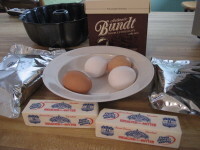 Easy to mix up and bake. Incredibly chocolate with big chocolate chunks. Great reviews from my guinea pigs family. DH made garlic-cheesy mashed pototes, fried shrimp with panko bread crumbs and I made fresh asparagus with sharp cheddar (and the bundt). I'm still debating whether I was a really smart cookie to get all my travel finished in one day or a really dumb cluck to get all my travel finished in one day. Well, almost one day. Technically, I made it home 30 minutes into the next day and was awake for, ohhhh, 22 hours....excluding airplane naps. I was not able to "catch up" up on sleep this morning. So, I'm wobbly this evening. Soon, I'll eat my pasta bake and some olive tapenade on toast, turn on the Dog Show, and climb into bed. I doubt I will be awake to see the winner. 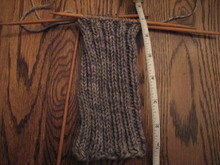 I made decent progress on the first wrist warmer on Monday. Perhaps I would have knit more on Monday, but I had several interesting conversations during my travels. Normally, this does not happen. On the flight from Minneapolis to Dallas, Michelle and I found shared interests of work and reading but she is a muggle (knitting-wise). Waiting in DFW for my flight back, I met Joan, who is a weaver who lives just south of Door County in Wisconsin. She was on her way home from an Elder Hostel trip to Mexico. She obviously enjoyed her trip and our conversation made the time waiting for our delayed flight go quickly. I'm especially happy about the UNDAMAGED part of the title after all the traveling I did yesterday. I found this on a fellow knit blogger's site and now I can't remember who. Thanks for the entertainment, whoever/whereever you are.